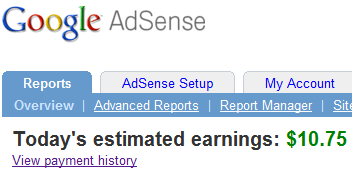 This month I hit an AdSense earning milestone where I exceeded $10 in a single day of AdSense earnings. 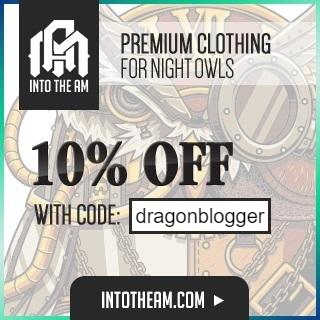 I have always had AdSense ads on DragonBlogger.com since it first started on August 23rd 2008 and by the end of the first sixteen months of my blog I had only received 3 AdSense payments of $100 and my site averaged about $20 – $30 per month in AdSense earnings on my sites combined. I made some modifications to banner ads and placements in February/March of 2010 and my earnings dramatically increased month after month since those changes. I wrote a post about tuning AdSense for performance and in making those changes I went from $25, to $45, $55, and even $69 in AdSense earnings on a single month which is nearly triple what I was earning previously. Combine that with now a single day of over $10.00 and if I could sustain this it would equal $300 per month in AdSense earnings which would be fantastic. My site only has a 15-20% increase in traffic between February and now, so the increase in traffic isn’t the primary cause for the AdSense income increase though it plays a small factor. It really is all about placement and size of your ads and I recommend having blog posts that have width to accommodate a 350×250 ad size with the ad placement toward the bottom. From my own experimentation ads at the bottom get clicked more often than ads at the top of a long article. If it is a short article where the Ad is still visible when you read the full article, I think its fine, but if you write 800+ word articles regularly you want to have the ad right next to where your reader leaves off when finished with your article. Don’t have competing sales or programs on the same article, they will just steal earnings from each other. Either AdSense or Infolinks, Amazon Ads or Adsense…etc. By having too much in the same article all you will do is trickle a random amount of traffic to each program and none of the programs will reach their max potential. Never put AdSense on a post dedicated to an affiliate program or commission product you are selling, this would pull potential purchases of your affiliate program as the AdSense would probably match a similar product that competes with what you are trying to sell anyway. There is virtually no easier way of making money than just simply installing an AdSense ad and letting it collect impressions and clicks. 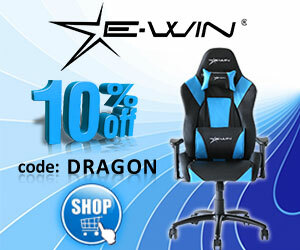 You don’t have to pitch or affiliate sell anything. 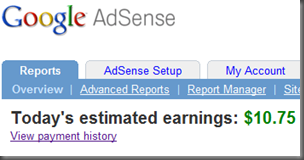 My goal was to generate at least $100 in AdSense income per month from my sites by the end of 2010 and I am very close to reaching that goal now. Though I can’t directly control AdSense income growth, by growing my traffic and tuning my AdSense block sizes, placements and styles on my sites I have greatly tuned and improved my AdSense income over the past four months.